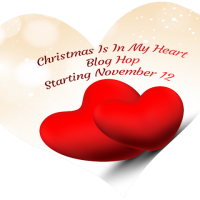 Welcome to the Christmas is in your Heart Blog Hop November 12 - 19. Each stop on the hop has a free project or tutorial and is offering a give-away for a free $25.00 Gift Certificate from The Fat Quarter Shop! I am offering a free Christmas placemat pattern which is great for using up those holiday fat quarters. The pattern includes instructions for matching folded napkins! Mix and match fabrics from a single fabric line or use up all those great holiday scraps. It is super easy and fun to make. . . . and is made from Fat Quarters! Click here to download your free pattern for these holiday placemats. The link to this post didn't arrive in my mailbox until November 14. I'm not sure why. A very nice place mat and folded napkin. Waiting for the folding instructions tomorrow! Very nice. I love that they have the little side pocket for silverware and napkins. Cute placemats. Thanks for the free pattern. Hope I can remember to come back tomorrow to get it. Those are very cute. It's nice to have a pocket for the napkin too. Thanks for the placemat pattern. Will stop back by tomorrow. a very clever design for place mat and napkin holder. A great idea to add a pocket to a placemat...very cute! Thanks for sharing! Great design! Thanks for sharing the pattern with us! Your place mats worked up beautifully. Very neat crosshatching. I'll definitely be back tomorrow for the pattern, Thank you so much. I enjoyed browsing you blog and now will be visiting regularly. Thanks for the free pattern. Love the little pocket to keep the silverware from running away. Seems like mine always drop to the floor to take five when I'm not looking. Hi,what beautiful place mats for Christmas! Thanks for the pattern too! Lovely place mats, I can see myself making these for lots of different occasions. What a clever pattern. Thank you for sharing. Love the place mat pattern! Thank You! Thanks so much for the place mat pattern, love it! Thanks for the pattern. Love the little triangle shaped pocket for the napkin. Love place mats and the corner napkin holder is so smart. That's a really good way to use up Christmas scraps. Thank you for the free pattern. It will be put to good use. Love your placemats! The fabrics are gorgeous! Thank you for sharing the pattern. This is a neat placemat! I like every one of the ones you showed us! Thank you for the pattern and for sharing on your blog! Thanks for the pattern! It will be great for us and for gifts! Cute placemats. Thanks for the pattern. Very fun place mats! I like the addition of the silverware pocket, neat idea! Thanks for sharing the pattern. The placemats are very cute, thanks for sharing the pattern! What a great pattern - they will make great Christmas gifts!!! Thank you for sharing the pattern! Thank you for the perfect Christmas placemat pattern. The silverware pocket is ideal! Love the napkins, too! Love very much the design of all the stuff you do. you have a nice taste. Your placemats are darling! I love the pocket you added for silverware or napkins. Lovely! Great placemats! Such cute fabrics.